One of our most popular stair railing options is a wrought iron railing. Versatile and beautiful, wrought iron railings offer an air of elegance and modernity that can be crafted and designed to fit any preference. In this week’s blog, we share some of the many design options that can be implemented through a wrought iron stair railing. First is a design option that is becoming increasingly popular: the “willow” balustrade. It is not hard to see why this is growing in popularity; this is an easy addition to any simple staircase to add a modern and elegant feel. The looping design immediately catches the eye of anyone who walks through the door with its striking yet simple statement. Next, we have a combination of a glass and wrought iron stair railing. 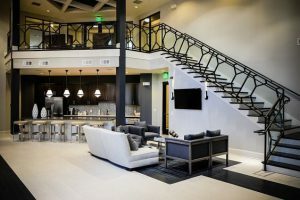 This stair was designed and installed for an apartment building in Atlanta, and it utilizes a unique, geometrical wrought iron railing design in addition to the glass backing. This gives the building a contemporary, modern design that leaves guests and residents in awe. While wrought iron railings are popular for modern designs, they can also be used to create a classic, traditional staircase. This can be seen through our next featured staircase, which utilizes wood and wrought iron to produce an air of elegance. To end our discussion on wrought iron stair railing options, we have an example below of a horizontal wrought iron system. Stair railings like these resemble cable railing systems, which is another one of our popular product offerings. Horizontal wrought iron stair railings add a lightweight, open look to staircases. When paired with this light wood as treads, the staircase becomes a work of art that captures contemporary elements. To see more examples of wrought iron railings, visit our wrought iron railings gallery. 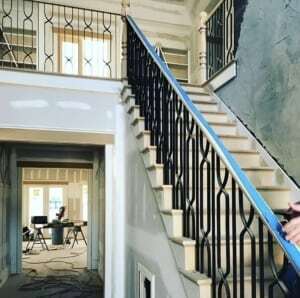 As shown through this blog, wrought iron stair railings are highly versatile and can be designed to fit any vision, whether it be modern, traditional, or rustic. We make the process of ordering custom stairs and ornamental metal handrails simple. If you have a specific design in mind, our team will work collaboratively with you to bring your vision to life. If you are seeking inspiration or ideas, we will help you to explore your options and make the best possible decision for your style and needs. Our reputation speaks for itself, and client satisfaction is our highest priority. From inspiration to installation, our team is committed to delivering the highest quality products. 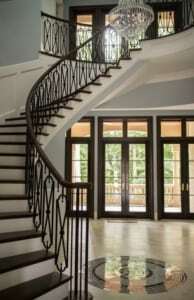 Contact us today to discuss enhancing your home with a wrought iron stair railing.